2002-03-06 Application filed by Moslehi Mehrdad M. filed Critical Moslehi Mehrdad M.
The speed and reliability performance parameters of state-of-the art semiconductor integrated circuit (IC) chips are mostly governed by the on-chip interconnects. Advanced semiconductor IC chips employ multi-level on-chip interconnects usually comprising aluminum (usually an alloy of aluminum comprising approximately 0.5% to 2% copper for improved electromigration reliability lifetime) metal lines, aluminum (again typically doped with copper) or tungsten plugs (for inter-level/inter-metal contact/via holes), and silicon dioxide (or fluorinated silicon dioxide SiO xFy) or a combination of silicon dioxide with an organic low-permittivity (low-k) dielectric used as inter-metal and inter-level dielectrics. The speed performance of advanced semiconductor IC chips such as high-end microprocessors and digital signal processors (DSP) fabricated using 0.25 μm complementary metal-oxide-semiconductor (CMOS) technologies and beyond is limited by the interconnect signal propagation delays. The signal propagation delay for advanced interconnects is limited by the parasitic resistive, capacitive, and inductive elements. These include the interconnect metal “RC” delays, capacitive cross-talks or cross-talk noise between adjacent metal lines (due to voltage pulses), as well as inductive noise and cross-talks (due to voltage pulses). The mainstream ILD/IMD materials in silicon chip manufacturing are silicon dioxide (SiO 2) and/or derivatives of silicon dioxide (such as fluorinated silicon dioxide: SiOxFy) with k values in the range of 3.2 to over 4.0. There has been a significant amount of materials research on low-k dielectrics. The lowest practical k values to date have been reported for some spin-on organic dielectrics and porous aerogels/xerogels. The practical low-k dielectrics developed to date have k values in the range of 2.0 to 3.2. These low-k dielectrics, however, complicate the back-end interconnect process integration due to their inferior thermal stability as well as their electrical, mechanical and thermal conductivity properties compared to silicon dioxide. FIG. 1 illustrates a side view of an interconnect structure  10 that includes a low-k organic ILD/IMD material layer 12 and trench 14. SiO2layer 16 covers ILD/ILD substrate 12. Covering trench 14 and top SiO2 layer 16 is conformal SiO2 buffer layer 18. The formation of organic low-k dielectric layer 12 also complicate the single or dual damascene processes commonly used for fabrication of copper interconnects due to the difficulties associated with their incompatibility with chemical-mechanical polishing (or CMP) processes used for copper and barrier removal during the interconnect fabrication process. As a result, most organic low-k dielectrics employ a suitable hard mask layer such as silicon dioxide for single or dual-damascene interconnect fabrication processes in order to facilitate formation of dielectric trenches and via holes for the embedded (inlaid) metal (e.g., copper) lines. The optimal integration of most organic low-k dielectrics requires deposition of a thin conformal layer of, for instance, silicon dioxide, such as SiO 2 layer 18, followed by an anisotropic oxide etch process in order to cover the trench and via hold sidewalks with a thin layer of high-quality silicon dioxide dielectric, such as SiO2 layer 18. This prevents a direct contact between the low-k dielectric and the deposited glue/barrier layer and may improve the overall breakdown voltage and leakage characteristics of the composite ILD/IMD layers. This requirement adds to the complexity and fabrication cost of the IMD/ILD integration. 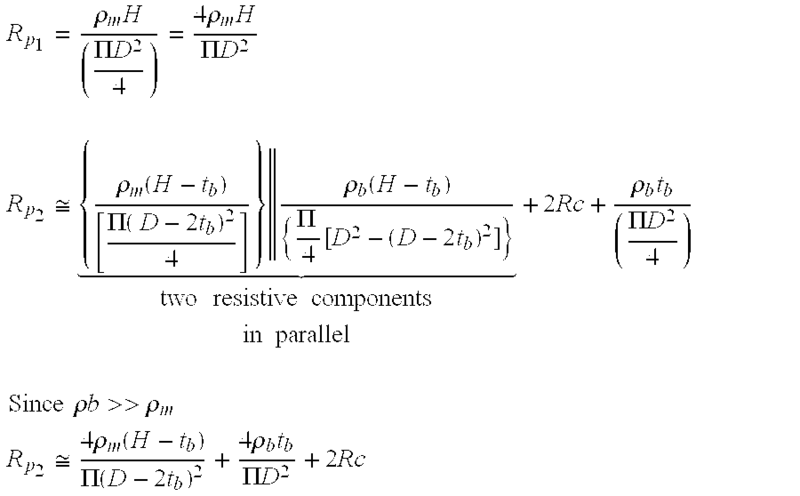 Moreover, the effective relative dielectric constant of the composite IMD/ILD layers is somewhat higher than that of the low-k dielectric by itself. This is due to the requirements for the hard mask and sidewalk oxide coverage. As the chip IC device dimension are scaled down, the width of the metal lines and also the dimensions or diameters of the via plugs are also reduced, whereas the thickness of the diffusion barrier layer is scaled down more slowly. Thus, with each successive technology generation, the barrier material thickness (and cross sectional area) becomes a larger fraction of the conductive interconnect lines. One example of this phenomenon can be examined in the case of dual-damascene copper interconnects. In IC chips with copper metallization, a larger fraction of the diameter of the conductive via plug is also consumed by the barrier material. For instance, for a damascene trench width of 0.20 μm and a conformal diffusion barrier thickness of 250 Å (deposited, for example, by a conformal chemical-vapor deposition or CVD process), the high-conductivity metal (e.g., copper with a resistivity of approximately 1.8 μΩ·cm) only occupies a metal line width or a via plug diameter-of only 0.15 μm, due to the peripheral space occupied by the diffusion barrier layer. Since the typical diffusion barrier layers have much higher electrical resistivity values compared to the high-conductivity interconnect metals (e.g., in the range of approximately 150-250 μΩ·cm for Ta and TaN diffusion barriers vs. approximately 1.8 μΩ·cm for copper), the diffusion barrier layer degrades the overall interconnect metal line resistance, as well as via plug resistance values. For instance, FIG. 2 shows damascene dielectric trench structures  20 and 22 (e.g., for fabrication of embedded copper metal line) with a width W and height H.
Similarly, the barrier layer can also degrade the effective via plug resistance. For instance, FIG. 3 shows via plugs  30 and 32 connecting the metal lines between two adjacent interconnect levels. Via plug 30 (FIG. 3a) includes metal plug between metal lines 34 and 35 which is fully surrounded at the bottom and sidewalls by the barrier layer 36. Via plug 32 of FIG. 3b, on the other hand, shows an ideal situation without a barrier layer surrounding metal plug 32 (connecting metal lines 38 and 40). R p 1 Δeffective via plug resistance without the barrier layer (FIG. 3b). Thus, R p z =1480+2RcΩ, which is the plug resistance for the via plug structure comprising the barrier layer. FIG. 4 shows one example of a prior art interconnect process flow  40 that results in a dual-damascene multi-level copper metallization interconnect structure in conjunction with inorganic interlevel dielectric (ILD) and intermetal dielectric (IMD) layers (e.g., fluorinated oxide or SixOyFz ILD/IMD material). In this example, tungsten is used to form tungsten contact plugs (to keep copper away from silicon) while copper is used for all the via plugs. The interconnect fabrication process (or back-end-of-the-line or BEOL process) flow starts after completion of the front-end-of-the-line (FEOL) process flow utilized for fabrication of the transistor and isolation (and other devices such as diodes, capacitors, etc.) structures, as step 42 indicates. Then, the diffusion barrier layer (TiN, Ta, TaN, or another suitable material) is deposited either by CVD or PVD (e.g., to form a 150 Å to 300 Å barrier layer) (step  62). The inlaid metal-1 interconnect lines are then formed by depositing copper (by MOCVD, PVD, and/or plating) followed by subsequent metal CMP and post-CNP clean through steps 64 and 66. The following dual-damascene copper interconnect level is fabricated by depositing the intermetal dielectric (IMD) layer (e.g., a multi-layer dielectric comprising a thin silicon nitride dielectric barrier and etch-stop layer, followed by deposition of SiO2, a thin Si3N4 etch-stop layer, and a top layer of silicon dioxide (SiO2) layer; the oxide layers may be replaced by a reduced-permittivity material such as SixOyFz), as shown in step 68. Then, a microlithography patterning process and a reactive ion etch (RIE) process sequence is used (step 70) in order to form the dielectric trenches for subsequent formation of inlaid copper metal lines. A follow-on microlithography patterning and dielectric RIE process sequence is used to form the interconnect via holes (step  72). Then, a diffusion barrier layer (TiN, Ta, TaN, etc.) is deposited by CVD or PVD, (step 74). Subsequently, a copper layer is deposited, as shown in step 78, (by MOCVD, PVD and/or Plating) and polished back by CMP, followed by post-CMP clean (step 80) resulting in formation of the embedded copper via plugs and inlaid metal interconnect lines. The repeatitive steps of IMD deposition, microlithograhy patterning and dielectric RIE processes (for via holes and interconnect metal line trenches), as well as barrier and copper deposition steps, and CMP and post-CMP clean are performed multiple times until all the necessary interconnect levels are fabricated, as verified at step 82. Then, the passivation overlayer (e.g., Si3N4 or SiON) is deposited by PECVD, at step 84. A microlithography patterning step and an RIE process step are used (step 86), to form the bonding pad openings or windows. The chip can then be packaged, as step 88 indicates. The process flowchart  90 of FIG. 5 presents another example of a state-of-the-art prior art interconnect process technology for formation of dual-damascene copper metallization with advanced low-k (e.g., K≦2.5) IMD/ILD layers. Process flow 90 is fairly similar to the prior art process flow of FIG. 4 except for additional process steps 92 and 94. The additional process steps 92 and 94 for integration of copper and low-k dielectrics are required in order to maintain good low-k dielectric integrity through the BEOL interconnect process flow and also to eliminate any process integration issues in terms of patterning and etch processes as well as any material compatibility issues. The description of the process flow outlined in FIG. 5 is essentially similar to that already provided for the flowchart in FIG. 4. One difference is that a thin layer of a hard mask material (such as SiO2) is used to protect the ILD or IMD low-k dielectric surface prior to any patterning and CMP process steps. Most of the organic low-k dielectric materials may be damaged in typical plasma ash processes used for removal of the patterned photoresist layers after patterning and etch processes (thus, the reason for the use of an oxide hard mask). Moreover, many low-k organic dielectrics may not be directly exposed to the CMP pad and slurry due to possible damage or degradation of their properties. This is another reason for using the oxide hard mask to protect the low-k dielectric. Moreover, this process flow forms a thin layer of dielectric (e.g., oxide) liner on the sidewalls of the dielectric trenches and via holes in order to protect a low-k dielectric from plasma etching and also to provide a good sidewall surface for deposition of the barrier layer. For IMD layers, the multi-layer stack comprises Si 3N4, low-k dielectric, thin SiO2, low-k dielectric, and thin SiO2. The lower and upper low-k dielectric layers house the via plugs and the inlaid interconnect metal lines on each level, respectively. The lower silicon nitride layer (thin nitride) is used as a dielectric diffusion barrier to encapsulate the lower level copper interconnect lines. The middle thin SiO 2 layer is used as an etch-stop layer during the formation of the metal trenches. A comparison of process flow 40 of FIG. 4 with process flow 90 of FIG. 5 indicates that integration of advanced low-k dielectric materials (such as organic low-k materials) results in added process complexity and increased IC fabrication cost compared to standard silicon dioxide IMD material or its related materials (such as fluorinated oxide). The following discussion focuses on the description of the interconnect process flows and structures of the present invention appearing in FIGS. 6 and 7. Two closely related preferred flows of invention (preferred process flow embodiments) are shown in the flowchart  100 of FIG. 6 and flowchart 150 of FIG. 7. First, the description focuses on the process flow 100 of FIG. 6. The back-end-of-the-line (BEOL) interconnect process flow starts after completion of the front-end-of-the-line (FEOL) fabrication process flow for the transistors, isolation regions, etc. (step 102). The next step is to deposit a blanket layer of a suitable dielectric diffusion barrier material which is also highly resistant against typical etch chemistries (e.g., HF-based etchants) used for oxide etching. For instance, it is possible to preferably deposit a layer of silicon nitride (e.g., 2000 Å to 5000 Å Si3N4) using thermal CVD, PECVD, or PVD (step 104). This layer will serve as a dense etch-resistant layer used for protection of the active transistor devices and isolation structures during subsequent etching of the disposable inter-level and inter-metal oxide layers. Moreover, this thick and dense etch-resistant dielectric barrier layer prevents any copper diffusion into the silicon substrate and active device regions during the BEOL interconnect processing. Other suitable dielectric materials (e.g., AlN or diamond-like carbon or DLC) may be used instead of Si3N4 for this material layer. After the blanket dielectric deposition process, the first disposable interlevel dielectric (ILD1) layer is deposited (step 106). This involves preferably a silicon dioxide layer to be deposited by CVD, PECVD, or even PVD at step 108. Next, dielectric CMP and post-CMP cleaning processes are performed (step 108) to form a globally planarized dielectric surface. This will provide a globally planar wafer surface throughout the multilevel interconnect fabrication process flow. Subsequently, a multi-layer disposable dielectric stack (e.g., SiO2/SiON/SiO2) is deposited by CVD, PECVD, or PVD (step 110). The stack includes upper and lower silicon dioxide layers separated by a thin etch-stop (or etch end-point detection) layer of a different material such as silicon oxynitride (SiON) or aluminum oxide (Al 203) or another suitable disposable material. The thin intermediate layer of oxynitride will be used an etch end-point marker during subsequent formation of the metal line trenches by CUSS anisotropic reactive-ion etching. After deposition of the multi-layer stack, a microlithography patterning process and subsequent dielectric RIE (anisotropic etching) process are performed, as shown at step 112, to form the contact holes. Then, another microlithography patterning process and an anisotrophic RIE process are used to form the dielectric trenches for the first level of metal interconnect lines (step 114). Next, the first level metallization is performed by sequential deposition of the barrier layer (e.g., Ta, TaN, WNx, or TiN by PVD or CVD) as shown in step 116, and a copper layer (by MoCVD, PVD, and/or plating), as indicated in step 118. Then, copper CMP and post-CMP clean processes are performed (step 120), in order to form the embedded copper contact plugs and inlaid metal lines. Next, fabrication of the next interconnect level proceeds by deposition of a suitable multi-layer disposable dielectric stack, preferably SiON/SiO 2/SiON/SiO2, formed by CVD, PECVD, or PVD (step 122). The silicon oxynitride (SiON) layers are relatively thin compared to the upper and lower SiO2 layers (e.g., 100 Å to 500 Å) and are used as etch-stop layers during subsequent RIE etch processes for formation of the via holes and metal line trenches. Other suitable materials such as aluminum oxide may be used instead of SiON as etch-stop layers. After the multi-layer stack deposition, two sequential steps of microlithography patterning and anisotropic RIE processes (steps 124 and 126) are performed for formation of the via holes and the interconnect metal line trenches. Next, a layer of copper is deposited (step 128), by MOCVD, PVD, and/or plating to fill the via holes and interconnect metal line trenches. Note that at this stage copper can be deposited directly on the patterned structure without a need for a diffusion barrier layer, thus, simplifying the interconnect process flow. If desired or necessary, an adhesion promotion glue layer may be deposited on the surface prior to deposition of copper. Subsequently, copper CMP and post-CMP clean processes are performed, at step  130, in order to form the embedded via copper plugs and inlaid interconnect metal lines. The repetitive steps of multi-layer dielectric stack deposition, fabrication of via holes and metal line trenches, copper deposition, and copper CMP (and post-CMP clean) are performed multiple times until all the necessary interconnect levels are fabricated, as verified at step 132. After formation of all the necessary interconnect levels, a top etch-resistant dielectric layer, preferably a silicon nitride layer (on the order of 2000 Å to 1 μm thick), is deposited by CVD, PECVD, or PVD, at step 134. Other suitable etch-resistant (and preferably high-thermal-conductivity dielectric materials) such as aluminum nitride or diamond-like carbon (DLC) may also be used instead of silicon nitride. The schematic diagram of FIG. 8 illustrates the example of a cross-sectional view of a multi-level interconnect structure (shown with six levels of copper interconnect) at this stage in the interconnect fabrication process flow. Next, a microlithography patterning process and a subsequent anisotropic RIE process are performed (see step  136) in order to form etchant transmission windows or openings within the top dielectric layer. The schematic diagrams on pages FIGS. 9, 10, 11 and 12 show several possible layout patterns of the etchant transmission windows, formed within the top etch-resistant dielectric layer. Preferably, the etchant transmission window pattern comprises openings or windows (squares, rectangular, circular, etc.) with at least one minimum-geometry in-plane dimension. For instance, the pattern of FIG. 9 shows an array of closely-spaced square windows. For a 0.18 μm technology node, these windows may have 0.18 μm×0.18 μm areas and the adjacent windows may be separated by 0.18 μm. The alternative pattern in FIG. 10 comprises an array of circular holes. Again, the holes may have minimum-geometry diameters (e.g., 0.18 μm diametric dimensions for circular holes separated by 0.18 μm from each other in a 0.18 μm technology). FIGS. 10 and 11 show two alternative etchant transmission window patterns comprising rectangular windows with larger overall transmission window area ratios (ratio of total area of the windows to the total surface area). The smaller side dimensions of these rectangular windows are preferably the same as the resolution of the microlithography tool (e.g., 0.18 μm for a 0.18 μm technology), while the larger side dimensions (lengths of rectangular windows) may be several to tens to even hundreds of microns (μm). The idea is to have an etchant transmission window pattern which provides a relatively large transmission area ratio (preferably ≧50%) and can be 4; subsequently hermetically sealed using a simple deposition process without a significant impact on the interconnect metallization structure. Preferably, the thickness of the top etch-resistant layer (e.g. Si3N4 or AIN layer deposited by CVD, PECVD, or PVD or any other vapor deposition process) is several times larger than the smaller side dimension of the etchant transmission unit cells. For instance, for a 0.18 μm technology, we may use a 0.70 μm-to-1 μm thick silicon nitride top etch-resistant layer with etchant transmission window cells (square, circular, rectangular, or any other shape) which have 0.18 μm minimum in-plane dimension (e.g., rectangular unit cells, with 0.18 μm×5 μm window size). Returning to FIG. 6, a highly selective etch (preferable a wet etch process such as HF-based etch) is performed at step  138 in order to selectively remove the entire multi-level disposable silicon dioxide dielectric structure. This etch chemistry and the resulting etch byproducts easily pass through the etchant transmission windows (or unit cells) facilitating the etch process. Due to the high packing density of the transmission unit cells and their relatively large area ratio, the selective etchant can easily remove the entire multi-level oxide and oxynitride dielectric stack bound between the lower etch-resistant layer (e.g., silicon nitride or aluminum nitride or DLC) and the upper etch-resistant patterned (e.g., also silicon nitride, aluminum nitride, or DLC) layer. The selective etchant (e.g., HF-based wet etchant) does not or should not attack the metallization structure and may remove only a very small fraction of the top and bottom etch-resistant layers (e.g., silicon nitride, aluminum nitride, or DLC). For instance, with a wet etch selectivity of 100:1 for oxide with respect to silicon nitride, removal of an equivalent oxide thickness of 10 μm (for removal of multi-level oxide and buried oxynitride layers plus some overetch), results in removal of about 0.1 μm silicon nitride from the top and bottom etch-resistant layers. This also results in enlargement of the etchant transmission windows (for instance, the 0.18 μm wide rectangular unit cells grow towards ˜0.38 μm wide windows). At this stage, it is possible to perform an optional thermal anneal as shown at step  140 (e.g., at a temperature between 250° C. and 400° C.) in order to form large grains and preferred highly oriented texturing in the interconnect structure for improved electromigration lifetime, and enhanced metallization conductivity as well as to relieve any residual stresses. This optional thermal anneal process may also be used to form a large-grain multi-level copper metallization system with “bamboo-type” microstructure for maximum electromigration lifetime reliability improvement. Next, the process flow continues with at least one deposition process and preferably two sequential material deposition process steps, as indicated at step  142. The first deposition process is a substantially conformal (CVD or PECVD) deposition process for deposition of a controlled thickness (e.g., 50 Å to 200 Å) of a dielectric material such as SiO2, Si3N4, AlN, Al2O3, etc. The preferred material is silicon dioxide. This conformal deposition process deposits a thin (e.g., 50 Å to 200 Å) layer of encapsulating dielectric material such as SiO2 over all the exposed surface areas of the multi-level metallization structure (metal lines and plugs). This deposition process also deposits a thin layer of the conformal dielectric over the exposed surfaces of the top etch-resistant patterned dielectric (e.g., silicon nitride), including the etchant transmission windows as well as a thin layer over the bottom etch-resistant layer. The amount of conformal dielectric thickness can be deliberately chosen to be small enough such that it is not sufficient to completely seal the etchant transmission windows or the top patterned etch-resistant insulator. Another practical process sequence for the hermetic sealing of the interconnect structure is as follows: (i) perform an atmospheric low-temperature silicon dioxide deposition (partially conformal) step using SiH 4/N2O in a helium carrier gas in order to deposit a thin layer of oxide on the metallization structure and to seal the etchant transmission windows; (ii) Deposit a layer of silicon nitride (or silicon oxynitride) as passivation overlayer (this may be a ˜5000 Å thick layer deposited by PECVD); (iii) Deposit a layer (e.g., 5000 Å to over 1 μm thick layer) of high-thermal conductivity insulating material, preferably aluminum nitride or DLC, by a suitable deposition process (preferably RF magnetron sputtering or PECVD). This exemplary process sequence results in complete hermetic sealing of the chip interconnect structure by re-producing a continuous top passivation layer. Moreover, this process sequence results in a helium-filled free-space intermetal/interlevel dielectric medium. The atmospheric helium free-space dielectric medium provides an excellent heat transfer medium within the multi-level interconnect structure; it also further suppresses any thermionic emission (resulting in electrical leakage currents) or gas breakdown effects due to the intra-level and inter-level voltages between the adjacent metal lines and conductive plugs. The example above shows the typical process flow for formation of a hermetically-sealed continuous dielectric layer on the top in conjunction with a hermetically sealed helium-filled (e.g., at or near atmospheric pressure) free-space interlevel/intermetal dielectric medium. If desired, the free-space helium pressure can be increased to above atmospheric pressure (e.g., 1 to 5 atmospheres) by c 0 performing the directional deposition (e.g., laser ablation) process (see FIG. 14) in a pressurized process chamber filled with higher pressure helium. It is, however, emphasized that the preferred method and structure of this embodiment employ atmospheric or near-atmospheric helium (or another suitable inert gas such as argon) to fill the sealed free space interconnect dielectric ILD/IMD volume. Lower helium gas pressures (e.g., 1 Torr to 1 atm.) as well as other types of gas (e.g., argon, nitrogen, hydrogen, etc.) may be used to fill the free-space region. A gas-filled free-space dielectric region is preferred over a near-vacuum free-space medium, both due to thermal management (efficient heat removal) and dielectric breakdown considerations. For instance, a helium-filled free-space medium  16 (preferably at or near atmospheric He pressure) provides a much superior heat transfer medium (in conjunction with the high-thermal conductivity copper metallization structure as well as the high-thermal-conductivity top and bottom etch-resistant layers), a superior breakdown-resistant interconnect structure, and a better thermionic-emission-resistant free-space medium compared to a vacuum free-space medium. As indicated in the process flowchart of FIG. 6, the next fabrication module is a microlithography patterning step (step  144), followed by an anisotropic dielectric RIE process in order to form the bonding pad windows by etching openings in the top passivation overlayer. The schematic diagram on FIG. 15 shows the multi-level copper interconnect structure after this patterning and etch step. This structure includes multi-level copper interconnects bound between the bottom dielectric diffusion barrier layer and the top high-thermal-conductivity hermetic sealing layer. The metallization structure is surrounded by a sealed free-space medium filled with an inert gas such as helium. Finally, the wafer is ready for dicing and packaging, at step  146 (such as flip-chip packaging). Note that the multi-level interconnect structure is fully hermetically sealed with an embedded free-space (preferably filled with He) ILD/IMD medium. This structure provides the highest level of interconnect electrical performance and reliability lifetime far superior to any interconnect structure comprising other low-k dielectric materials. Alternatively, as shown in the alternative process flow  150 of FIG. 7, it is possible to reduce the number of microlithography masking steps by one, through combining the microlithography patterning steps for the etchant transmission windows and bonding pads. Process flow  150 of FIG. 7 is essentially similar to the first embodiment (shown in FIG. 6) through the copper CMP and post-CMP cleaning processes for the last (topmost) level of copper interconnect, i.e. step 132. Next, the top etch-resistant dielectric layer (or multi-layer material stack) is deposited by CVD, PVD, and/or PECVD, at step 134. For instance, it is possible to deposit either a layer of dense silicon nitride (e.g., 5000 Å to ˜1 μm thick) by PECVD and/or PVD, or a bi-layer of Si3N4/AlN (e.g., 5000 Å to over 1 μm silicon nitride followed by 5000 Å to over 1 μm aluminum nitride) by PECVD and/or PVD. Then a microlithography patterning process and a subsequent anisotropic dielectric RIE process are performed sequentially to form the etchant transmission windows (corresponding to a suitable pattern such as one of those examples shown in FIGS. 9-12), and also the bonding pad windows at step 152. Note that this masking step combines the layouts of the etchant transmission windows and the bonding pads into one microlithography mask. Next, the disposable silicon dioxide ILD/IMD layers are selectively removed using a highly selective wet etchant at step  138. This results in the multi-level interconnect structure with free-space ILD/IMD medium surrounding the intercconect structure. Next, the copper metallization structure is coated with a controlled thin layer (e.g. 50 Å to 200 Å) of silicon dioxide (or silicon nitride or another preferably insulating material) and the interconnect structure is hermetically sealed using the multi-step (e.g., two or three step) conformal/nonconformal dielectric deposition processes (step 142), as described in detail in association with FIG. 6. The next fabrication process step is a blanket plasma (e.g., RIE) dielectric etch-back process until the bonding pads are re-exposed, at step 144. This etch-back process, at step  144, can be easily endpointed using an optical etch end-point detection method (e.g., laser reflectance endpoint). Finally, the wafer is diced into IC chips and the chips are packaged using a suitable packaging technology. Based on this alternative second embodiment of this invention, the total number of microlithography masking step for an N-level interconnect structure is 2N+1, which is the same as the number of masks required in conventional prior art interconnect process flows. The first embodiment of this invention (shown in FIG. 6) employs 2N+2 microlithography masking steps. 2. The multi-level interconnect structure of claim 1 wherein at least a portion of said electrically conductive interconnect segments is made of copper. 3. The multi-level interconnect structure of claim 1 wherein at least a portion of said electrically conductive plugs is made of copper. forming the bonding pad openings. 37. The method of claim 36, wherein at least a portion of said plurality of metallization levels and electrically conductive plugs is formed within said disposable material layers using a damascene process flow. 38. The method of claim 36 wherein said multi-level interconnect structure is formed using 2N+1 microlithography masking steps for N metallization levels. 39. The method of claim 36 wherein said multi-level interconnect structure is formed using 2N+2 microlithography masking steps for N metallization levels. 40. The method of claim 36 wherein said disposable inter-level and inter-metal material layers comprise silicon oxide. 41. The method of claim 36, further comprising the step of forming said multi-level interconnect structure to be supported by a bottom electrically insulating buffer layer, said electrically insulating bottom buffer layer separating said multi-level interconnect structure from underlying transistors and isolation regions fabricated within said semiconductor integrated circuit substrate. 42. The method of claim 36, further comprising the step of forming said electrically insulating bottom buffer layer to provide additional mechanical support for said multi-level interconnect structure. 43. The method of claim 42, further comprising the step of forming said electrically insulating bottom buffer layer to further provide a dielectric material with effective diffusion barrier properties against contamination of the semiconductor substrate by the contaminating metallization materials and external ionic contaminants. 44. The method of claim 36, further comprising the step of forming said hermetically-sealed free-space medium to comprise a gaseous material. 45. The method of claim 44, further comprising the step of forming said gaseous material to be in the pressure range of less than 5 atmospheres. 46. The method of claim 45, further comprising the step of forming said gaseous material to be at or near atmospheric pressure. 47. The method of claim 36, further comprising the step of forming said encapsulating layer to comprise an electrically insulating layer. 48. The method of claim 36, further comprising the step of forming at least a portion of said plurality of electrically conductive interconnect segments and plugs to comprise a high electrical conductivity material. 49. The method of claim 48 wherein said high electrical conductivity material comprises copper, silver, gold, aluminum, or a superconducting material. 50. The method of claim 48 wherein said high electrical conductivity material is deposited using chemical-vapor deposition, physical-vapor deposition, and/or electroplating.